The singer enhances her usual black-and-white get-up with a red midriff-baring shirt. Also, her usual restrained pompadour is now wild and free. 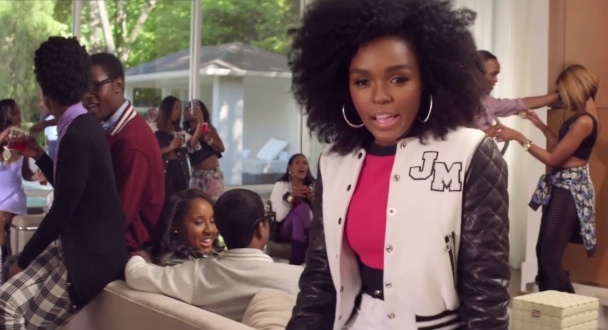 The narrative has Monae at a party for the Electro Phi Betas sorority. A wall of Electro Phi Beta alumnae — TLC’s T-Boz, Estelle, Esperanza Spalding, Monica and Kimbra — come to life as background singers during the party. And look out for a dancing cameo from T.I. toward the end. I like this song and video…It has that 90’s vibe to it.